Michael L. Gross is Professor of Political Science and Head of the School of Political Science at the University of Haifa, Israel. He was born in Chicago and grew up in Skokie IL, leaving for Israel in 1971. After studying in Jerusalem, Evanston and Chicago he returned to Haifa in 1990 to teach at the University of Haifa. Michael Gross has published widely in medical ethics, military ethics military medical ethics and related questions of medicine and national security. His articles have appeared in the American Journal of Bioethics, The New England Journal of Medicine, The Journal of Military Ethics, The Cambridge Quarterly of Healthcare Ethics, The Hastings Center Report, the Journal of Medical Ethics, the Journal of Applied Philosophy, theJournal of Cyber Security and elsewhere. His books include Ethics and Activism(Cambridge 1997), Bioethics and Armed Conflict (MIT 2006), Moral Dilemmas of Modern War: Torture, Assassination and Blackmail in an Age of Asymmetric Conflict(Cambridge 2010); The Ethics of Insurgency: A Critical Guide to Just Guerrilla Warfare (Cambridge 2015) and two edited volumes - Military Medical Ethics for the 21st Century (Routledge, Military and Defense Series, 2013) and Soft War: The Ethics of Unarmed Conflict (Cambridge 2017). 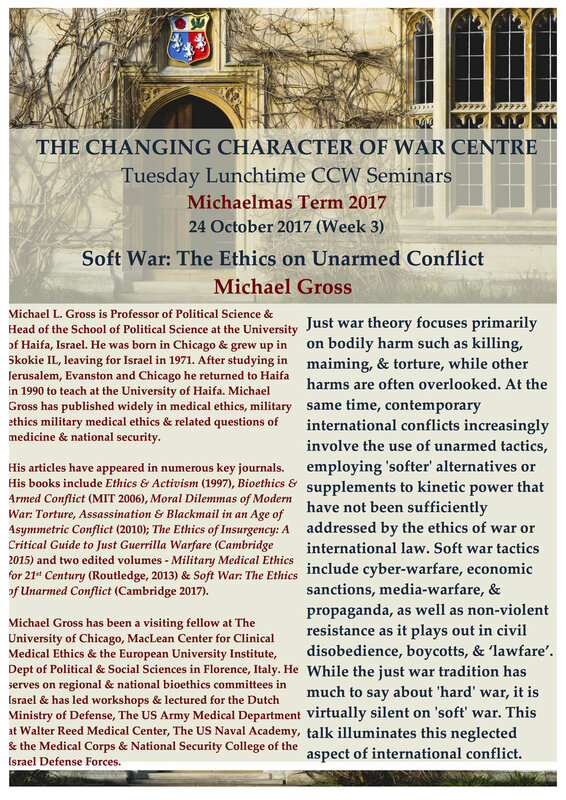 Michael Gross has been a visiting fellow at The University of Chicago, MacLean Center for Clinical Medical Ethics and the European University Institute, Department of Political and Social Sciences in Florence, Italy. He serves on regional and national bioethics committees in Israel and has led workshops and lectured on battlefield ethics, medicine and national security for the Dutch Ministry of Defense, The US Army Medical Department at Walter Reed Medical Center, The US Naval Academy, and the Medical Corps and National Security College of the Israel Defense Forces.